I love to shake up conventional associations people have with objects and ideas. 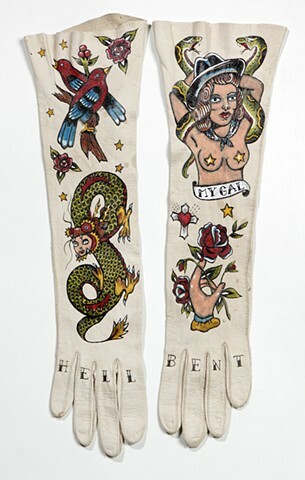 Traditional American tattoos are made of up small glyphs that work as a shorthand to communicate basic human emotions. The heart, star, snake, dagger, pin-up, and skull are just some of the basic building blocks of this visual language. Jung called these blocks "archetypes" and wrote extensively on the effect these images and ideas have on our unconscious mind. The glove is more than just a practical protection from the elements. Its a metaphor for a kind of traditional modest femininity. The gloves I use are roughly dated from the 1900-1960s, a time when ideals of feminine purity and class status were closely tied to the fashion standards of their time. What images are masculine, what are feminine, what are certain ideals and expectations associated with these and how can I subvert those standards drive this work body of work.